The arrival of implementation day of the 2015 nuclear deal with Iran, known as the Joint Comprehensive Plan of Action, marks a historic milestone in the process to block Iran’s pathways to a nuclear weapon and to ensure that Tehran’s nuclear activities remain exclusively peaceful for many years to come. Against significant odds, Iran, the United States and its P5+1 negotiating partners (China, France, Germany, Russia and the United Kingdom), concluded the nuclear agreement last July. After the completion of the domestic review processes in the United States and Iran in October, the two sides began to take the major steps to implement the agreement. 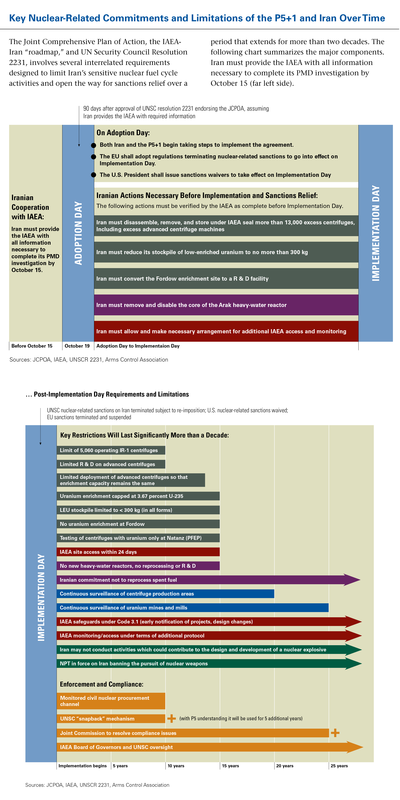 Now, with the International Atomic Energy Agency’s (IAEA) determination that Iran has completed key steps that significantly limit its nuclear program in four major categories and the initiation of more stringent monitoring and verification provisions (see below), formal implementation has begun, which includes the removal of nuclear-related sanctions.. But implementation day is just the beginning of a complex process that will require vigilance and continued commitment from Iran, the IAEA, the P5+1, and the EU over the next several decades. To reach implementation day, Iran had to verifiably dismantle over 13,000 centrifuges, including its advanced machines, leaving Tehran with 6,104 first-generation IR-1 machines, of which 5,104 are enriching uranium to 3.67 percent. The remaining 1,044 machines are at the Fordow site, which cannot be used for uranium enrichment under the agreement for a period of fifteen years. Iran’s uranium-enrichment program will be capped at these numbers for a decade, after which the capacity will remain constant for several years, but advanced machines will be slowly phased in to replace the IR-1s. The 13,000 plus IR-1 and IR-2M machines that Tehran dismantled under the nuclear deal are being stored under IAEA seal and supervision at Natanz. If Tehran wants to access these machines to replace damaged, operating centrifuges, the IAEA must monitor any replacements. Iran must use those machines for replacements and cannot produce any new centrifuges until the stockpile of old machines runs out. Research and development on advanced machines is also stringently limited. During the first eight-and-a-half years of the deal, Iran will be able to keep one IR-4, IR-5, IR-6, and IR-8 machine at the pilot plant for research purposes. Iran will be able to feed these machines with uranium gas, but it cannot withdraw any enriched material. 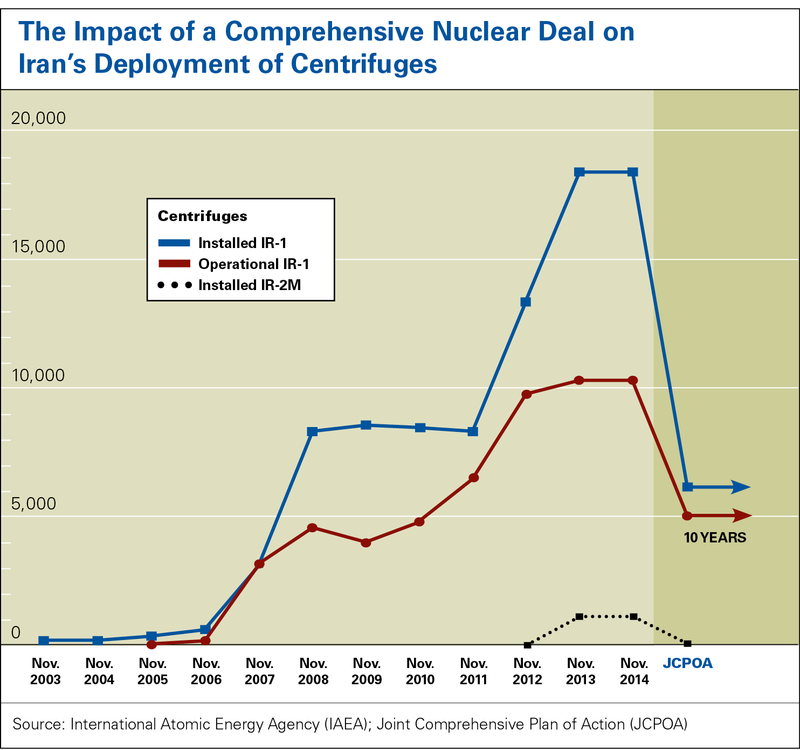 In the two years prior to conclusion of the November 2013 interim agreement, know as the Joint Plan of Action, which halted the expansion of Iran’s program, Tehran installed more than 10,000 centrifuges, and the number of machines it was using to enrich uranium significantly increased, from 6,500 to 10,200. For the first time, in 2013, Tehran also installed 1,008 advanced IR-2M machines in its production hall at Natanz. The IR-2Ms are estimated to be 3-5 times more efficient than the first-generation IR-1s. It is impossible to predict exactly how much further Iran’s capacity to produce nuclear bomb-grade material might have advanced in the absence of the P5+1 and Iran nuclear deal. However, if Tehran had continued along its pre-deal trajectory, it would have nearly 30,000 machines installed at its enrichment plant and would be operating nearly 15,000 of them today. If the advanced IR-2 machines were brought online, that would have increased Iran’s enrichment capacity even further. The nuclear deal also caps Iran’s stockpile of uranium enriched to 3.67 percent at 300 kilograms, which is far less than what is necessary to enrich further to one bomb. To meet implementation day requirements, Iran shipped out over 8.5 tons of uranium enriched to this level on Dec. 28. The stockpile cap and the prohibition on enrichment above 3.67 percent will remain in place for the next 15 years. The interim deal of 2013 halted Iran’s production of uranium enriched to 20 percent, an area that posed a more significant concern because 20 percent enriched material is far easier to enrich to weapons-grade (over 90 percent uranium-235). At the time of the interim deal, Iran had produced about 450 kilograms of uranium enriched to 20 percent. Of that amount, about 185 kilograms were in gas form, which can be easily fed back into centrifuges for additional enrichment. About 250 kilograms of 20 percent enriched uranium is enough for a bomb, when enriched to weapons grade. The remainder was in powder form for fuel plates for Iran’s Tehran Research reactor or in scrap/waste form. Under the interim deal, Iran converted its remaining stockpile into powder. Under the final, Joint Comprehensive Plan of Action, all of the 20 percent material that is not in fuel plates, was shipped out the country. Absent the deal, by January 2016, if Iran continued 20 percent uranium enrichment at the same rate, it could have produced enough 20 percent enriched uranium in gas form for nearly three nuclear weapons. Iran’s unfinished heavy-water reactor at Arak had the potential to produce enough weapons-grade plutonium which, if separated from the spent fuel, could provide the material for two nuclear weapons, nearly 8 kilograms, on an annual basis. If Iran had completed the reactor and began operations with nuclear fuel, it would have been impossible to target the reactor in a military strike without releasing devastating radiation into the air. That threat is neutralized under the deal. As part of the comprehensive deal, Iran removed the core of the reactor and filled the channels with cement, rendering it inoperable. The P5+1 worked with Iran on a new design which will optimize medical isotope production, while significantly lowering the output of weapons-grade plutonium to less than one kilogram. China will work with Iran on the ground to modify the reactor, while the United States played a key role in reviewing the design. Iran also agreed not to reprocess any spent fuel for the next 15 years or build any new heavy-water reactors. Iran also agreed to permanent restrictions prohibiting activities relevant to developing a nuclear explosive device under the nuclear deal. While Iran committed not to pursue nuclear weapons when it joined the nuclear Nonproliferation Treaty (NPT), the deal requires Iran to adhere to restrictions beyond its NPT obligations. Iran agreed to forgo computer modeling to simulate nuclear explosive devices, testing, developing, or acquiring multi-point explosives and neutron sources, and development and designing of nuclear explosive diagnostic systems. The NPT does not explicitly prohibit research or use of explosives suitable for nuclear weapons for non-nuclear purposes. There are a number of explosives designs that, while used in nuclear weapons, have other military applications and civilian uses, such as oil drilling. Iran has used these alternative applications as explanations for its nuclear weaponization work, which the IAEA assessed was an organized program prior to 2003. In the future, if caught conducting research in these areas, Iran will not be able to claim it is undertaking any of these activities for non-nuclear purposes. The nuclear deal puts in place a multilayered system for monitoring every element of Iran’s nuclear fuel supply chain and the import of materials and technologies that could be used to grow Iran’s nuclear program. In addition to continuous monitoring of enrichment at the Natanz and the Fordow facilities, including real-time monitoring of enrichment levels, the IAEA will continuously monitor Iran’s production of centrifuges for 20 years. It will be able to continuously monitor uranium mines and mills for 25 years and account for all of the material in Iran’s nuclear fuel chain. Together, these measures ensure that if Iran were to pursue a covert nuclear weapons program it would need to surreptitiously replicate its entire nuclear supply chain to get the necessary fissile material. While no single element of the monitoring regime offers a 100 percent guarantee against cheating, the multilayered approach, particularly combined with information gathered by national intelligence organizations, provides the high confidence that Iran cannot deviate from the restrictions under the deal without prompt detection. In addition to the comprehensive safeguards agreement that is already in place, the IAEA’s monitoring and inspections authority will be strengthened by Iran’s implementation and eventual ratification of Iran’s additional protocol and adherence to Code 3.1 of Iran’s comprehensive safeguards agreement. Under the additional protocol, the IAEA is granted expanded rights of access to information and sites. States must provide information about all parts of its nuclear fuel cycle and all sites where nuclear material may be located. The expanded list of sites includes uranium mines, fuel fabrication and enrichment plants, and nuclear waste sites. Inspectors can also visit these sites on short notice to resolve questions or inconsistencies or check for undeclared nuclear material. The notice for complementary access can be as short as two hours for verification of design information, ad hoc, or routine inspections. Inspectors are allowed to conduct environment samples, use detection and measurement devices, and check mechanisms, such as seals, that are put in place to prevent tampering or diversion. Inspections provisions to allow access to undeclared sites is also unprecedented. While the Model Additional Protocol requires states to give IAEA inspectors managed access to non-nuclear sites, including military facilities, if concerns about illicit activities arise, there is no time-limit for access. For the first ten years of the deal, Iran must allow IAEA inspector access to any site, if concerns arise. The longest possible delay would be 24 days – far less than what would be necessary to sanitize a site. Modified Code 3.1 requires countries to submit design information for new nuclear facilities to the IAEA as soon as the decision is made to construct, or authorize construction, of the facility. If Iran implements modified Code 3.1 under a comprehensive deal, the IAEA will receive information about any plans Tehran has to expand its nuclear program earlier than it would under the status quo. Iran would also be obligated to share any design changes to existing nuclear facilities. This would be particularly useful in the event of an agreement to ensure that design changes fit within the agreed upon limits of Iran's nuclear program in a final deal. IAEA monitoring regime will be bolstered by national intelligence agencies, including the U.S. intelligence community. National agencies played a critical role in exposing Iran's past clandestine nuclear facilities, including Natanz in 2002 and Fordow in 2009. While the restrictions on each area of Iran’s nuclear program are critical, the agreement with Iran is more than the sum of all of its parts. Every element must be implemented to continue blocking Tehran’s pathways to nuclear weapons. Together, the restrictions dramatically limit Iran’s nuclear activities and the stringent monitoring and verification will ensure that Tehran toes the line of the deal. And the sanctions relief Tehran receives in return will likely boost its economy and serve as an incentive for continued compliance with the provisions of the nuclear deal. The continued, successful implementation of the nuclear deal effectively removes the threat of an Iranian nuclear weapon for at least 15 years and probably more, and it enhances the security of the United States, our close allies, and the international community. But it should not be viewed as a panacea. It will not repair the U.S.-Iranian relationship overnight. Nor will it solve the many problems in the Middle East. It may open doors to make progress on these areas, but whether or not it does so should not impact perceptions of its success. Now that implementation day has arrived, the nuclear deal accomplished what it needed to – it has significantly extended the time it would take for Iran to try to pursue nuclear weapons and it guards against a nuclear-armed Iran for over well over a decade.